The Saint George Charity will be manning the British stand at this month’s Manilva International Festival on Saturday 19 May from 12 noon, where they will be offering a wide range of traditional British cakes, with fresh homemade lemonade, tea and coffee to wash it down. As part of the event, and following the success of last year’s event, the charity is once again organising the Manilva Great British Bake-Off contest, with a cash prize for the winner. 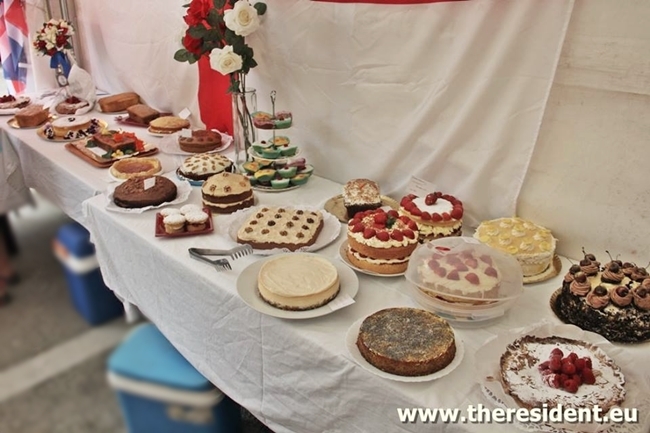 The competition is open to entrants of all ages and nationality, and the cakes should be traditional British recipes, such as: Victoria Sponge, Chelsea Buns, Treacle Tart, Scones, and so on, there are plenty to choose from. You can enter as many cakes as you like and entry is just 2 euros per item, with all the entry money raised going to the winner of Top Baker. All cakes entered will be sliced and sold on the British stand to raise money for this years’s Saint George Charity Feed a Child Campaign. Entry forms are available from the Saint George Charity Shops, or from the Sabinillas Bookshop. So come on get baking!